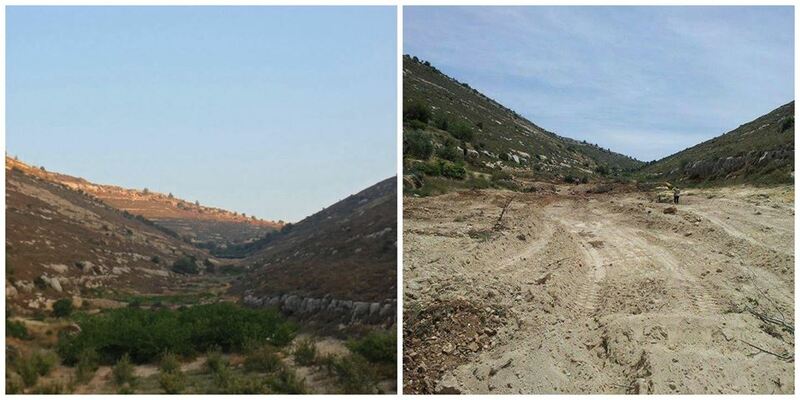 Israeli Military Destroys Orchards at Tent of Nations – Please Act Now! I am heartbroken to report that the Israeli military has destroyed between 1,500 and 2,000 fruit trees at the Tent of Nations – the Nassar family farm located south of Bethlehem. I have written extensively about Tent of Nations and the work of Daoud Nassar, whose struggle to keep his family farm has provided an inspiring model of peaceful resistance to oppression. I have personally visited his farm with members of my congregation on more than one occasion (most recently this past October) and have hosted Daoud on his visits to Chicago. Those of us who know Daoud know him to be a profoundly decent and honorable man, thoroughly dedicated to the cause of a just coexistence between Israelis and Palestinians. (On a stone next to the front gate of the Nassar farm are the words “We Will Not Be Enemies.”) Given his personal circumstance, his innate compassion is truly inspirational – and that’s what makes this latest turn of events all the more sickening. I am forwarding this letter from Bill Plitt, Executive Director of Friends of Tent of Nations, below. Please, please join me in acting on behalf of the Nassar family farm now. We are writing this letter to call for action against acts of injustice by the Israeli Military towards the Nassar family farm and their Tent of Nations Peace Project. This farm (known as Daher’s Vineyard) is located just six miles southwest of Bethlehem in the Occupied Territories of Palestine (the West Bank). As you know, this family has registration papers for their 100-acre farm dating back to the Ottoman Empire, and they are now in a situation where the Israeli Defense Forces (IDF) brought in bulldozers on May 19, 2014 and destroyed between 1,500 and 2,000 mature, fruit-bearing apricot and apple trees and grape vines, all in the lower valley of the farm. This move was totally unexpected as their latest case for proving ownership has been in the Israeli Military/Civil Courts since February 2013. An appeal was also made on May 5 to protest a warning placed on the land in late April 2014 that declared the land as “State Land” and should be “evacuated”. There was no warning ahead of time about the impending destruction, however (as is the usual case), so the Nassars were caught off guard with the wanton destruction that took place. In addition to the destruction of the trees, the terraced land on which the trees were planted was also destroyed, left in a state of rubble that cannot currently be re-planted. We are appealing to you to contact appropriate congressional committee members, members of Congress, and others you know who may have some influence in this kind of situation; this can include your church leaders as well and an article in your local newspaper would be more than welcome. We are including a short letter and a timeline of past events you can use to educate people about the details of this farm’s history as well as a sample letter you can use to send out if you want. In particular, we ask that you contact the U.S. Department of State, the Israeli Embassy in Washington, DC, the U.S. Ambassador to Israel, the U.S. Ambassador in Tel Aviv, and the Consulate General in Jerusalem and ask them to investigate the circumstances surrounding this travesty. We urge you to contact these authorities as well as others you know personally. You have our permission to use information from this letter in your appeals. We also urge you to sign our Petition Letter and forward it to all of your own personal contacts, urging them to forward it also. We would like to have you act on this information as soon as you can in the hopes that we can prevent any more destruction from taking place on Daher’s Vineyard. If you have any questions, please do not hesitate to contact me at ___________ . – In 2009, on two separate occasions, Israeli soldiers forced their way onto the property, conducting searches of family members and internationals and threatening to return with eviction papers. They never followed through on that particular threat. – In May of 2010, they did issue nine demolition orders to remove buildings, tents, animal sheds and restrooms which they claimed the family had no permission to build. The Nassars went to court to stop the demolitions, and no action was taken on the part of the Military courts. – In April 2011, a court decision was made, without the family’s lawyer present, to follow through on the demolition orders because of a plan to build an Israeli-only road nearby. The lawyer intervened and, to date, no action has taken place. – On February 14, 2012, as the family was working in the ‘Trees of Life’ orchard, volunteers found, in three different places (under rocks and tacked onto trees), papers with maps signed by the Civil Administration of Judea and Samaria (which is the Israeli Military Government) giving them 45 days to appeal their claim to the land or the land would become State Land. This order covered one-third of the existing 100-acre farm. The family lawyer filed an appeal immediately. Many other Palestinian farmers discovered similar notices under rocks on their land. To date, there has been no decision on the appeal. – On Monday, May 19, 2012, demolition orders were posted on a portion of the farm in the valley in the same manner as the earlier notices. This time the authorities identified a cistern which has been in use for ten years that was scheduled to be demolished within three days. While the order was contested, the Court ruled in favor of the military, but no action has been taken. – Other acts of harassment have occurred on a regular basis. On May 5, 2012, civil authorities came and removed the barricade on the road that connects both the farm and the village of Nahalin to Route 60, the main north/south highway in the area. The next day, the bulldozer came and re-barricaded the road, thereby preventing any movement by local residents. Palestinians now, in order to travel between Bethlehem and the Nassar family farm, must travel through the villages of Nahalin and Husan. This is a burdensome detour for them as well as for the 20,000 villagers affected by these new regulations. – On December 13, 2012, military trucks and large jeeps entered the west side of the village of Nahalin and destroyed olive trees that grow between the village and the settlement of Beitar Elit in the west. Immediately after doing so, they drove to the east side of the village, near Daher’s Vineyard (the family property) and uprooted several fruit trees belonging to village farmers in addition to trees on the Vineyard. – On December 16, 2012, the Nassar family received notice that their appeal to the Military Court had been denied. The Nassars were given 45 days (January 30 deadline) to demolish the structures themselves or reapply for permits which will cost them $1,500 per structure. Under the ‘New Rules’ they will also need to submit a zoning plan and sign an agreement that, if the permits are denied, they will pay for the costs of demolishing the structures. The Nassars are trying to determine the intentions of the Israelis in the hope that access to the farm can be preserved. They have reapplied again for permanent registration of their land. As always, the family wishes to proceed calmly, constructively and legally. – The family must reapply for all previous permits (13) including the more recent structures, such as: big tent, cistern near home, a cistern in the valley; and the office trailer. They must do this with the understanding that for those structures denied a permit, the Nassars must demolish them at their own expense. – They must submit additional land survey maps: one topographical map which shows the farm location in the region; two technical maps, one at 1/250 scale and the other 1/50,000 scale, which show the new structures and their locations and dimensions. – They must submit plans for sources of providing electricity and water to the land from the village and for provisions for gray water and filtration systems. – They must apply for approval/signature of the Israeli Ministry of Agriculture, certifying that the land is agricultural land. The courts have not as yet responded to the Nassars appeals or requests for building permits. – In January 2014, three “stop cultivation” orders were found on the land. The Nassars had their lawyers look into the situation, but the courts have not responded to these appeals, either. – In early May 2014, 1,000 dunums (250 acres) of land bordering the road leading to the farm and south of the nearby village of Nahalin were declared as State Land; this was land owned by other Palestinian farmers. The old blockade to the road leading to the farm was enlarged with additional piles of rubble and boulders, making it even more difficult to walk from the road to the Tent of Nations Peace Project site. – In late April, the Israeli Military authorities placed a warning on the land declaring that the trees were planted on “State Land” and, there, constituted a trespass and should be “evacuated”! – On May 5, 2014, the Nassar family filed an appeal with the Military Court against the order. According to the law, no demolition or evacuation is allowed once an appeal is filed and until a final verdict has been forthcoming. – On May 19, 2014, the Israeli Military bulldozed between 1,500 and 2,000 mature, fruit-bearing apricot and apple trees and grape vines growing in the lower valley of the farm and destroyed the terraced land that had been cleared for planting. There was no forewarning given, and this was an illegal act on the part of the IDF. This entry was posted in Human Rights, Interfaith, Israel, Nonviolence, Palestine, Peace on May 21, 2014 by Rabbi Brant Rosen. Please read and take action in response to this outrageous destruction of a family’s orchards. It is unspeakably inhuman, but understandable, given the contempt that Israel authorities have for Palestinians, treating them like vermin they are trying to eradicate and exterminate from land that Israel considers theirs. What is described here is as heartbreaking as it is deplorable. I would like more information on what it means to take action or demand action on this matter. Is the idea that the IDF will be held to account? By whom? Certainly, the farm could not be fully restored in less than a decade. What would justice be in this instance? I have several emails from FOTONNA (friends of Tent of Nations North America) suggesting actions North Americans can take to make our governments pay attention to the destruction at Tent of Nations; I just don’t know how to get the information to you. If you feel comfortable doing so, leave me a message on Facebook (Linda Johnson Carraway) with your email address and I will forward the emails to you. ( You don’t need to be my “friend” to send me a message via FB). FOTONNA also has a Facebook page. Just one more tragedy after another. Here is a genuinely decent man who want s to live in peace caught up in a Government that is not engaging much in the process. My heart goes out to this man who worked hard and know sees everything in ruin. My sympathies would be toward anyone in this mess. Palestinian or Israeli..
Oh I have forwarded a letter to the appropriate people involved. This new calamity has only one positive purpose and that is to rouse people of good will to so forcefully object in ways that will let Israel know in no uncertain terms that its abuse of the Palestinians must come to an end, that it will not be countenanced ever again. Those politicos who have received funds from AIPAC must reject them and discover new funding from persons who will support them as a reward for their daring not to kowtow to the Israeli state. “When you besiege a town for many days, waging war against it, to seize it, you are not to bring ruin on its trees, by swinging-away an ax against them, for from them you eat; them you are not to cut down — for are the trees of the field human beings, able to come against you in a siege?” (Deut 20:19, transl by Everett Fox, The Five Books of Moses; (Schocken, 1998). Torah could hardly be clearer, or more in the great tradition of menshlichkeit that is the best fruit of the Jewish people. Was it for cutting down that fruit and these verses that generations worked so hard to create a “Jewish” state? Thank you. Well said. One might expect Israel to ponder and follow it’s own Scripture ethic even if it doesn’t honor its God. Daoud Nassar is a personal friend of mine . Our church has hosted him in Cambridge, MA and we visited the farm during our pilgrimage to the Holy Land in 2011. At that time, I endowed a tree on the farm. So now it is very likely “my” tree has been destroyed. I feel personally violated by the Israeil military because of this egregious illegal action. So I am sharing just a tiny bit in the suffering our brothers and sisters in Palestine endure every day. I would also point out that when I tried to send a protest email to the Israeli Consulate for New England in Boston, via their web site, their site kept blocking my message, saying my text had “illegal characters.” Even though I tried retyping it three times. What a surprise!…. I wanted to demand reparation from the Israeli State for the destruction of my tree. To Nasser Family and their struggle we dedicate this link both in English and Hebrew. We are from Brazil and our names are Flavio (jewish) and Helena(catholic), married for 33 years. A small group and I from Ohio stayed overnight at Nassar’s farm in our travels through Palestine. How happy Daher, Daoud’s brother, was to see the rain come with us. He clapped because he said all the trees and garden plants were so happy now. In this northwestern part of Ohio several groups and I will do all we can to raise our voices loud and strong in support of Daoud and all his courageous, peaceful efforts to remain faithful on the land. We met Daoud last November at his farm and heard his courageous story. He is a Christian of great integrity , an inspiration to all the young people who work at the Tent of Nations. I am so sorry for this despicable vandalism. My deepest regrets, dear Nasser family. I cannot understand why Mr Obama is just remaining quiet about these injustices and keeps on pledging his support to Israel. Am very disappointed and sad to see these atrocities continuing. It is very apparent to me that Israel wants to take over all of Palestine. The world keeps sympathising with the Jews but nothing is being done about the suffering of the Palestinians and all the atrocities being done by Israel to the people of Palestine. Palestinians did not cause the Holocaust, then why is Israel causing suffering to them?? They have carved out Israel from Palestinian property. All this Biblical Land belonging to them is ridiculous. Through ages land has changed hands because of conquests.About the only person who speaks the truth on this matter is past President Jimmy Carter. It is high time that Britian acknowledges the wrong it did by creating Israel out of Palestinian Lands, and it is high time that USA stands up for what is right and just. Was there three years ago with CPT – even some settlers have volunteered with the youth work there! Just today, had the opportunity to meet and speak with the President of Rabbis for Human Rights. What a waste of human energy and labor!! How can such an act be justified by those who ordered the cutting down of the trees?! It is beyond comprehension and such an anti-peace gesture, at the very least. When will the violence stop? Our hearts go out to you and your family David Nassar. May you be given strength and ability to continue your courageous peaceful path in life. BarBara a member of the local Palestine Support Group in the UK. God bless us with hope for peace and life for all people in the future. Dear All, dear Rev Yates, I earnestly hope we can forgive them, but I regret that to say that ‘they don’t know what they’re doing’ is mistaken. They are attempting to destroy the Peace process and they are doing it in a cruel, heartless and illegal way. My heart goes out to the Nassar family and to all others in a similar situation. I can think of nothing sadder than the destruction of this amazing community that refuses to be enemies and teaches the meaning of nonviolence and peace to so many. I too feel personally violated to think that the trees I planted have now been destroyed in this way. But more that that, I grieve for all who face unjust situations every day just because they are Palestinian. Best of luck to the family!! I am truly saddened by the thug like behavior of the idf. This was a despicable and cowardly act on the part of the Government of Israel and the military forces who carried out the destruction. Sadly it is hardly surprising that peace loving Jewish people in many parts of the world now feel threatened. A major part of the cause of this lies in the reaction of many to the unbridled acts pf terrorism carried out by the Government of Israel against the people of Palestine. A government that cries “antisemitism” to any criticism of it’s actions, believing it appears, that what was suffered through the Holocaust , must exempt them from any criticism. Terrible beyond any words that that was, many others died it that diabolically inhuman tragedy.. One would have thought that a nation with such a history of abuse, would have the greatest empathy with people in any similar situation. Clearly that is not the case, total arrogance appears to be the prevailing sentiment. One day that will be the Nations undoing.